Israeli soldiers treat a wounded comrade after he was stabbed by a Palestinian, wearing a yellow vest, during clashes in the West Bank, Oct. 16, 2015. President Barack Obama expressed concern about the outbreak of violence in Jerusalem, calling on regional leaders to “tamp down” on rhetoric that might feed “violence or anger or misunderstanding." “And I don't think we can wait for all the issues that exist between Israelis and Palestinians to be settled" to curb the violence, the president declared Friday. He added, “But in the meantime, right now, everybody needs to focus on making sure innocent people aren't being killed." U.S. Secretary of State John Kerry will meet with Israeli Prime Minister Benjamin Netanyahu next week, the State Department confirmed Friday, adding that the meeting will probably take place in Germany although details have not been finalized. Kerry, who is in Milan on a European tour, spoke to Netanyahu by phone Friday evening about how best to end the violence in Jerusalem. Kerry had a similar phone conversation with Palestinian leader Mahmud Abbas on Thursday. Kerry told both leaders the U.S. would remain engaged in efforts to restore calm, a spokesman said. Netanyahu is scheduled to meet with the German Chancellor in Berlin on Wednesday. A Palestinian protester reacts to tear gas fired by Israeli troops during clashes near the border with Israel, in the east of Gaza City, Oct. 16, 2015. A Palestinian man posing as a journalist was shot dead after he stabbed and wounded an Israeli soldier outside the West Bank settlement of Kiryat Arba, the Israeli army reported Friday. The knife attack occurred while demonstrators threw stones at the Israeli troops. The man, disguised in a fluorescent yellow vest over a T-shirt marked “PRESS,” was allowed to approach troops. News photos posted online show him clutching a knife and attacking a soldier before he was shot dead. The 20-year-old soldier was hospitalized with “moderate” stab wounds to his back and shoulder, according to The Times of Israel. Israeli Prime Minister Benjamin Netanyahu, second left, watches the screen during a press conference at the Foreign Ministry in Jerusalem, Oct. 15, 2015. The incident is the latest in a series of Palestinian attacks, mostly stabbings,that have killed seven Israelis. Thirty-two Palestinians have been killed by Israeli soldiers and police, some during the attacks and others during demonstrations. 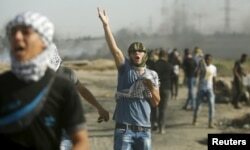 The U.N. Security Council was scheduled to hold an emergency meeting Friday to discuss the worsening unrest in Israel. The meeting comes at the request of council member Jordan. Hundreds of Israeli soldiers and thousands of additional police have been deployed to the streets to help maintain order amid fears of new protests. A group of about 100 Palestinians used Molotov cocktails to set fire to Joseph's Tomb overnight in the Palestinian town of Nablus. The mob was later dispersed by Palestinian security forces, who also put out the fire. It is not clear how badly the fire damaged the site where the biblical patriarch Joseph is said to have been buried. The Israeli army will bring "perpetrators to justice, restore the site, and ensure that freedom of worship returns to Joseph's Tomb," Israeli army spokesman Peter Lerner said via Twitter. Palestinian President Mahmoud Abbas condemned the attack, calling it "irresponsible," and ordered an investigation. 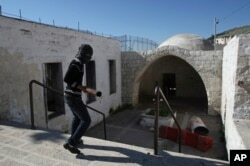 FILE - A masked Palestinian youth walks into Joseph's Tomb during clashes with Israeli troops nearby, in the West Bank city of Nablus, April 24, 2011. On Thursday, Israeli Prime Minister Benjamin Netanyahu said he is willing to meet with Abbas to end the surge of violence, but said the Palestinian leader must stop what the Israeli leader calls lies about Israel. "I'd be open to meeting with Arab leaders and the Palestinian leadership in order to stop this incitement and set the record straight," Netanyahu said. Specifically, he demanded the Palestinians stop spreading rumors that Israel intends to take over the East Jerusalem holy site Muslims call the al-Aqsa mosque and Jews call the Temple Mount. The prime minister also blasted Palestinians for what he calls the "new big lie" that Israeli security forces are executing Palestinian terror suspects. He said Israel is doing what any government would do in dealing with "people wielding knives, meat cleavers, axes, trying to kill people on their streets." The AFP and Reuters news agencies contributed to this report.